Ticket sales are now open. Buy tickets for this years festival here. Folk n Roll are a brand new celtic/rock band from the isle of lewis. 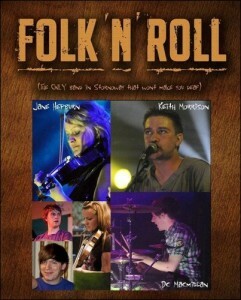 Come see Folk n Roll go folking crazy at the sea angling club. The first ever Whisky Galore Festival takes place on the beautiful island of Barra in September, 2009. This Hebridean jewel is the very same island where Whisky Galore – the hilarious 1949 Ealing comedy, based on the book of the same name by Compton MacKenzie – was filmed. In typical island fashion, Barra and Vatersay embrace the opportunity of yet another party. The Whisky Galore Festival is a unique chance to savour that renowned island hospitality and be part of history in the making. Music by Skippinnish,Face the West and Vatersay Boys. Main Office, Castlebay Hall, Castlebay, Isle of Barra.